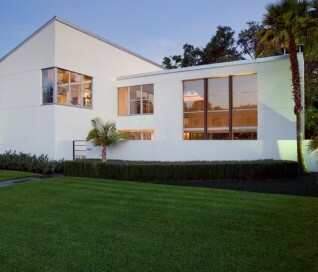 A Memorial-area art collector residing in a chic modern home wanted his house to be more visible from the street. His yard was full of trees, and he asked us to consider removing them and developing a more modern landscape design that would fully complement the exterior of his home. He was a personal friend of ours as well, and he understood that our policy is to preserve as many trees as possible whenever we undertake a project. However, we decided to make an exception in his case for two reasons. For one thing, he was a very close friend to many people in our company. Secondly, large trees simply would not work with a landscape reflective of the modern architecture that his house featured. 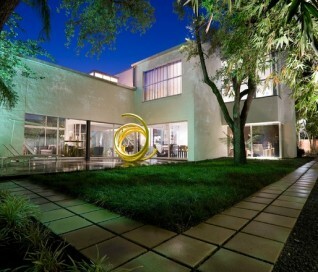 The house had been built as story structure that was formed around a blend of unique curves and angles very reminiscent of the geometric patterns common in modern sculpture and art. 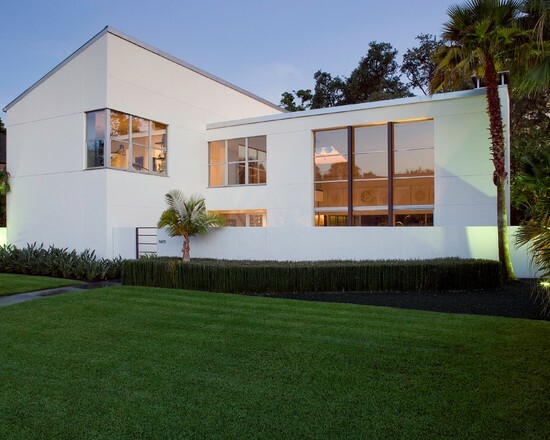 The windows had been built deliberately large, so that visitors driving up to the house could have a lighted glimpse into the interior, where many sculptures and works of modern art were showcased. The entire residence, in fact, was meant to showcase the eclectic diversity of his artistic tastes, and provide a glimpse at the elegant contents within the home. 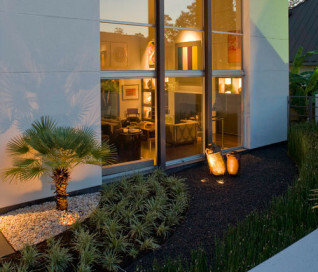 He asked us to create more modern look to the landscape that would complement the residence with patterns in vegetation, ornamentation, and a new lighted water fountain that would act like a mirror-image of the home. He also wanted us to sculpt the features we created in such a way as to center the eye of the viewer and draw it up and over the landscape to focus on the house itself. 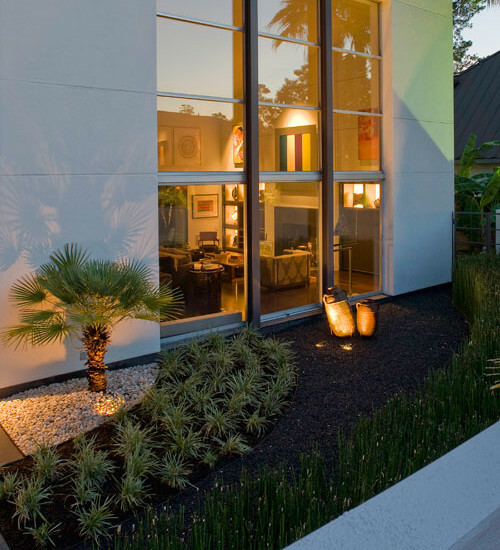 The challenge was to develop a truly sophisticated modern landscaping design that would compliment, but in no way overpower the façade of the home. 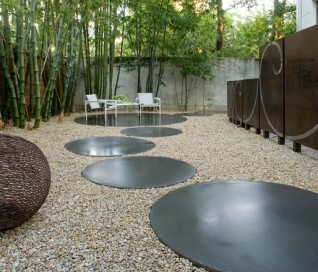 In order to do this, we had to focus very carefully on the geometric appearance of the planting areas first. Since the vegetation would be surrounding a very large, circular stone drive, we took advantage of the contours and created a sense of flowing perspective. We were then very careful to plant vegetation that could be maintained at a very low growth height. This was to prevent vegetation from behaving like the previous trees which had blocked the view of the house. Small hedges, ferns, and flowers were planted in winding rows that followed the course of the circular stone driveway that surrounded the fountain. We then centered this new modern landscape plan with a very sophisticated contemporary fountain. 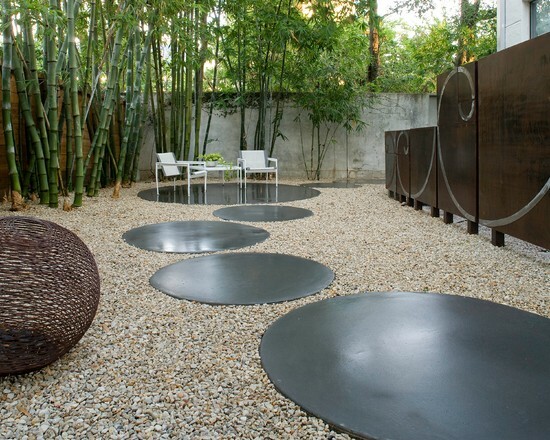 We chose a circular shape for the fountain both to center the eye and to work as a compliment to the curved elements in the home’s exterior design. We selected black granite as the building material, partly because granite speaks to the monumental, and partly because it is a very common material for modern architecture and outdoor contemporary sculpture. 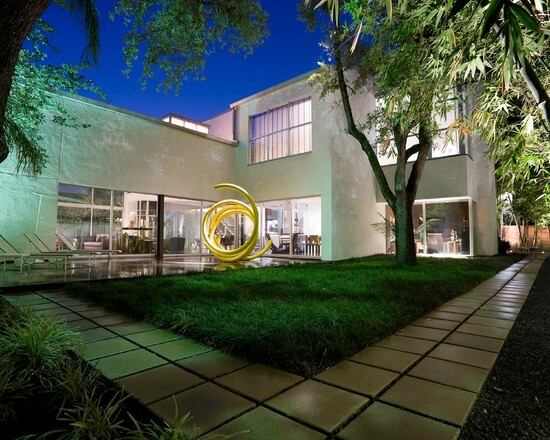 We placed the fountain in the very center of the driveway as well, which had the effect of making the entire landscape appear to converge toward the middle of the home’s façade. To add a sense of eclectic refinement to the fountain, we then polished the granite so that anyone driving or walking up to the fountain would see a reflection of the home in the base. To maintain consistency of the circular shape, we radius cut all of the coping around the fountain was all radius cut from polished limestone. The lighter color of the limestone created an archetypal contrast of light and darkness, further contributing to the modern theme of the landscape design, and providing a surface for illumination so the fountain would remain an established keynote on the landscape during the night.